It’s crunch time here at Faith Family Home School!! I’m buckling down and digging through the rest of the preparations before we begin our school year next week. One of thing things I’m working on is checking and stocking up on our SUPPLIES. Part of planning ahead and being prepared is making sure that we have the supplies we need to do the projects that we want to do. This year, unlike in the past, I’ve converted a small cabinet in our dining room into an honest to goodness supply cabinet.. I’ve never had a supply cabinet!! It’s kind of exciting. ;0) In the past, boxes of crayons and scissors and glue sticks and everything else has been spread out and stored in a variety of places. 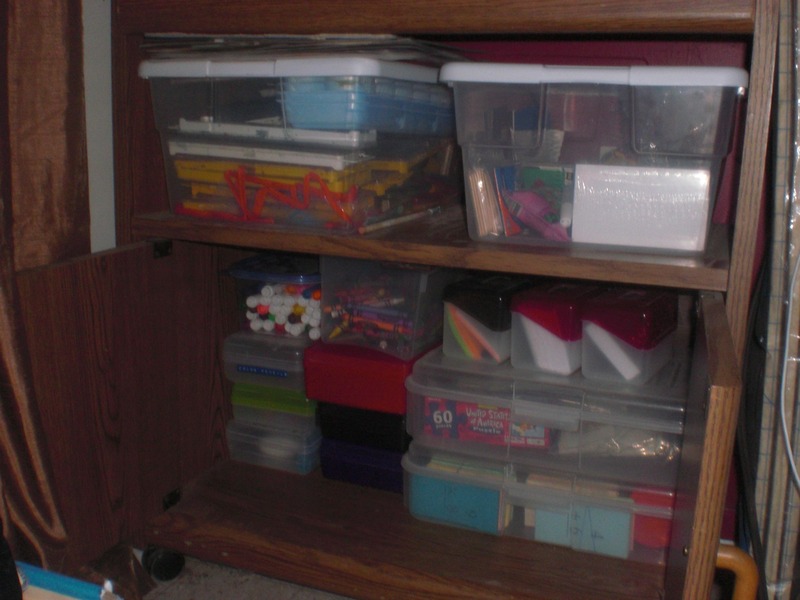 At one point all of the craft and crayon type supplies were ALL stored in the top of the closet in the girls’ room. That became a problem, though, and I removed most of them. And now they’re all out of the closet and EVERYTHING is neatly stored in the ‘new’ supply cabinet. I like the sight of a pretty row of boxes. Speaking of dusting.. that leads me to our TO DO LISTS. I love to do lists. They help me stay focused. My kids work well with short to do lists, also (which is why we use a modified workbox type system — I’ll share that in a couple of weeks when we get to “W.”) Right now, with the start of school around the corner, my To Do list is quite huge! Still! I scratch a few things off and find a few things that I have to add! ~ order Princess’ math curriculum!! The ABC’s of Homeschooling is hosted by Dawn @ 5 Kids and a Dog. A Retreat to Minister to Homeschool Moms ~ And one of YOU gets to go for free.